When we think of liver disease, we think of excessive alcoholic consumption, but the truth is non-alcoholic fatty liver disease (NAFLD) is the most common cause of chronic liver disease including end-stage liver disease. Unfortunately, fatty liver disease PCOS and obesity seem to go hand in hand, not to mention insulin resistance and stage 2 diabetes. For pre-menopausal woman with PCOS, this becomes a major issue as studies show fatty liver disease PCOS and obesity are interrelated. Central adipose obesity (high belly fat) and insulin resistance are considered the main reasons for fatty liver disease for those with PCOS. Limited studies have shown that advanced liver disease is more prevalent in obese PCOS patients. As of now, there are no medical interventions for NAFLD, what is recommended is diet, weight loss and exercise. Unfortunately, due to most preferring medical intervention over diet, weight loss and exercise fixing fatty liver disease seems out of most people’s reach. But it doesn’t have to be. In the case of those with fatty liver disease PCOS and obesity, you have no real choice. Hopefully, you’ll choose the smart, healthy option. All the research says it works, but nothing will work when your liver reaches a critical point, so step up and do it now. There are some studies that suggest metformin can help stage 2 diabetic obese women with PCOS, but again overall it is suggested there is no medical intervention. Results from studies done on bariatric patients are scary for the morbidly obese. In the general population, the prevalence of NAFLD is 3-24%. In those undergoing bariatric surgery, the morbidly obese, it is 84-96%. Ouch! Even though the members of RFBC choose food and exercise to beat obesity, that statistic belongs to us, preRFBC, as well. A study done on 25 women with PCOS showed that with marine based Omega-3 supplementation (vegans will argue with this, but it seems plant based omega-3 is different from marine based omega-3) liver fat is reduced significantly compared to placebo. Another study done on 70 obese individuals with fatty liver showed that after a six-month calorie restricted diet those with higher insoluble fiber intake from fruit had the greatest improvement to overall liver health. As a result of these two studies, I am confident in my long-term belief in our diets. I may revisit plant based omega-3s. In essence, for long-term maintenance, I do believe in a 50/50 diet and can see where some salmon might fit in. How do you know if you have non-Alcoholic Fatty Liver Disease? Fatty liver disease is asymptomatic and symptoms, if any, such as fatigue and malaise, are easily pushed off as other things. The only true way to know if you have NAFLD is laboratory tests and liver imaging. From my own personal experience, just checking liver enzymes is not enough and sometimes those liver enzyme tests can be misleading. Therefore, from my research, I feel confident in believing, those of us who are morbidly obese are at high risk for fatty liver disease. PCOS and obesity are definite indicators that it is time to clean that liver through diet, weight loss and exercise. When I first started researching fatty liver, my own, my liver enzymes were normal, but I knew something was wrong and therefore requested blood panels. My liver enzymes were fine. After three months on my raw food diet, they were elevated probably from detoxing, and by my sixth-month blood work, they were back to normal. I admit, I self-diagnosed my fatty liver through my amino protein blood panel. Many of the amino proteins that were below low were non-essential amino proteins produced by my liver. After 9 months of eating a low glycemic fruit-based diet, all my amino proteins were back to normal ranges. As were thyroid T3 and T4 levels, estrogen and progesterone–all regulated by the liver. Here’s a great article to help you understand the function of the liver on female hormones. Did I have fatty liver PCOS and obesity? While never diagnosed as such, I definitely was obese. I hadn’t had a period in fifteen years yet within months of my low fat, low sugar, low sodium raw diet, my period returned and on a regular cycle. It seems like I would have been classified as PCOS and as a result of my above paragraph, I’m reasonably sure I had fatty liver. Nine Months of hiking and doing our Rawk Starz diet and all of that was in the past! Maintaining a healthy liver becomes paramount for women with PCOS. That means obesity cannot be an accepted part of their lives. It is so easy to accept obesity and even PCOS as part of who we are. But if we look at the true damage our lifestyle is creating we must take action. The diets we offer at RFBC are very cleansing of the liver as evidenced by myself and many other women who have come through camp and changed their sugar levels, thyroid diagnosis and hormone imbalance. The reality of fatty liver disease PCOS and obesity for anyone reading this since RFBC attracts the obese is pretty high. So now the question is are you ready to do something about it? 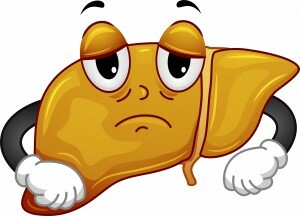 Since before finding raw food, I believed the liver to be the most important organ in our body. This research has only reinforced my belief that it is our duty to care for our livers through proper nutrition and exercise. High fat, high sugar, sedentary lifestyle choices must be given up. Maybe you’re not into diets like we offer at RFBC. So what? There are plenty of other healthy diets out there. Therefore, if you are obese, have PCOS, are diabetic or believe you have insulin resistance, it’s time to change. Time to stop putting it off. Each day of poor eating results in another day of fat being added to your liver. Because non-alcoholic fatty liver disease can be deadly you need to do some smart thinking. Is all that high-fat high sugar food worth taking the risk? Most importantly, don’t let fatty liver disease PCOS and obesity keep you down. Take charge now and change your life. The relationship between the thyroid gland and the liver. Malik R, Hodgson H.QJM. 2002 Sep; 95(9):559-69. Long-term metformin treatment is able to reduce the prevalence of metabolic syndrome and its hepatic involvement in young hyperinsulinaemic overweight patients with polycystic ovarian syndrome. Clin Endocrinol (Oxf). 2011 Oct; 75(4):520-7. The epidemiology of nonalcoholic fatty liver disease in adults. J Clin Gastroenterol. 2006 Mar;40 Suppl 1:S5-10. Review. Omega-3 fatty acid supplementation decreases liver fat content in polycystic ovary syndrome: a randomized controlled trial employing proton magnetic resonance spectroscopy. J Clin Endocrinol Metab. 2009 Oct; 94(10):3842-8. Fruit Fiber Consumption Specifically Improves Liver Health Status in Obese Subjects under Energy Restriction. Cantero I, Abete I, Monreal JI, Martinez JA, Zulet MA. Nutrients. 2017 Jun 28;9(7). pii: E667. doi: 10.3390/nu9070667. World J Gastroenterol. 2011 Aug 7;17(29):3377-89. doi: 10.3748/wjg.v17.i29.3377. Review. Omega-3 fatty acids: comparison of plant and seafood sources in human nutrition. J Am Diet Assoc. 1991 Mar;91(3):331-7.